Home Dashboard Warning Lights Why is the Oil Pressure Light On? Why is the Oil Pressure Light On? The oil pressure light is on because either there’s not enough oil circulating in the engine to keep critical components lubricated and friction-free, or that the engine oil pump has a fault and is not circulating oil either sufficiently or at all. What Should I do if the Oil Pressure Light Comes on? 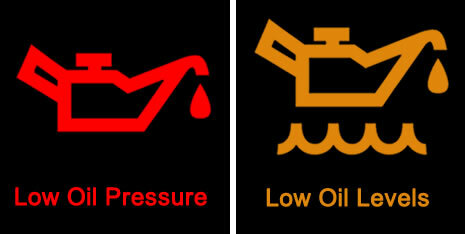 If the oil pressure light comes on, as soon as it’s safe to do so, pull over and immediately turn off the engine. Try and stop in the least hazardous place possible for other road users as it’s there’s a chance that you’ll be unable to use your car. You’ll now need to investigate the issue to establish which actions to take next. If I don’t Stop, What Might Happen? If the fault is due to low oil pressure, friction on the internal engine components will continue to increase. Friction and excessive heat will result in your engine seizing, causing catastrophic damage. 1. Oil Pressure or Oil Level? If possible, establish whether the fault is related to the oil pressure or oil level. 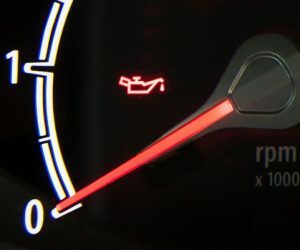 Some vehicles use the same dashboard symbol for both, where as others have separate symbols. If it is a yellow low oil level symbol, you should be good to carry on with your journey providing you top up with oil soon. If the symbol is red, or red flashing, pull over as soon as safe to do so and turn off the engine. Open the bonnet / hood of the car, locate the dip stick and check the engine oil level. If oil level is low, replenish oil until it reaches the appropriate marker on the dip stick. If engine oil levels do not require topping up, avoid restarting the engine as damage may occur. If you have topped up the engine oil, restart the engine to check if the oil light goes out. If the oil light comes on once again even after a top up, this indicates an oil pressure issue. Turn off the engine as you’ll be unable to drive the vehicle. To avoid serious and expensive damage to the engine, arrange to have your vehicle towed to either your home or to be repaired. If the engine requires topping up with oil frequently, there could be a leak due to a broken gasket or lose / incorrectly fitted oil filter. Check for signs under the engine for dripping oil. This can be seen particularly when the vehicle has been parked overnight with oil stains on the floor. Low engine oil pressure can often be be a costly job to fix. Basic engine maintenance will enable your engine to run trouble-free and more efficiently for longer. It’s advised to have a regular engine service (at the very least a basic service) to change oil, oil filter and spark plug every 12 months or every 12,000 miles – whichever comes first. Cars with heavy use should be serviced more frequently.